Ulstein Design has signed contracts with the yard Astilleros de Sevilla in Spain for delivering design and equipment packages to two ULSTEIN PX105 platform supply vessels. 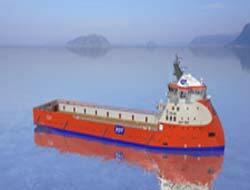 The ships will be built for the shipping company EDT Offshore Ltd, Cyprus. The contract is worth around NOK 240 million. The Ulstein Group will supply design, detail documentation and main equipment. This includes products such as main switchboards, bridge and control room consoles, ULSTEIN IAS (integrated alarm and surveillance system), ULSTEIN COM and navigation equipment. The vessels have the classification Clean Design (double hull), comfort class V3, dynamic positioning (DPII), ample capacity with 107,654 sq. feet (1,000 sq. meters) of deck space and a deck load capability of 3,000 tons. The 4,700 DWT vessels are 291.34 ft. (88.8 meters) long and 62.34 ft. (19meters) wide and have accommodations for 23 persons. The ships are scheduled for delivery from Astilleros de Sevilla in April and August 2009.